What makes you think, “Pesach”? Is it the sight of the grocery shelves, rearranged, when you stop in for some milk? Is it packing away the Purim costumes, knowing what comes next? Maybe it’s your children, coming home with cleaning charts and decorated dustpans. For everyone, it’s the Simcha in the air, the mysterious happiness that creeps into everyone hearts as Yom Tov approaches. Klal YIsorel has a cherished possession, a special group, that while few in number are holding up the world, they are our cherished Kollel Yungerleit. They give up a lot and show an unbelievable mesiras nefesh throughout the year, living a simpler lifestyle, and many times having to give up on physical luxuries. They pull through, by cutting corners, but when Yom Tov arrives the real challenge begins, they are barely making it month to month, how will they afford the many Yom Tov necessities. In 2014, The Lakewood Kupas Yom Tov was founded by bnei hayeshiva to help their fellow bnei hayeshiva with the overwhelming expenses of Yom Tov. These diligent and humble yungerleit are able to manage their expenses year-round by living simple lives, but the heavy costs of Yom Tov are beyond what they can handle alone. With this kupah, not only are these ehrliche yeshivaleit lifted of their heavy burden, but the community at large has the opportunity to partner with the Torah learning of true scholars and unite in their zechusim. Helping approx. 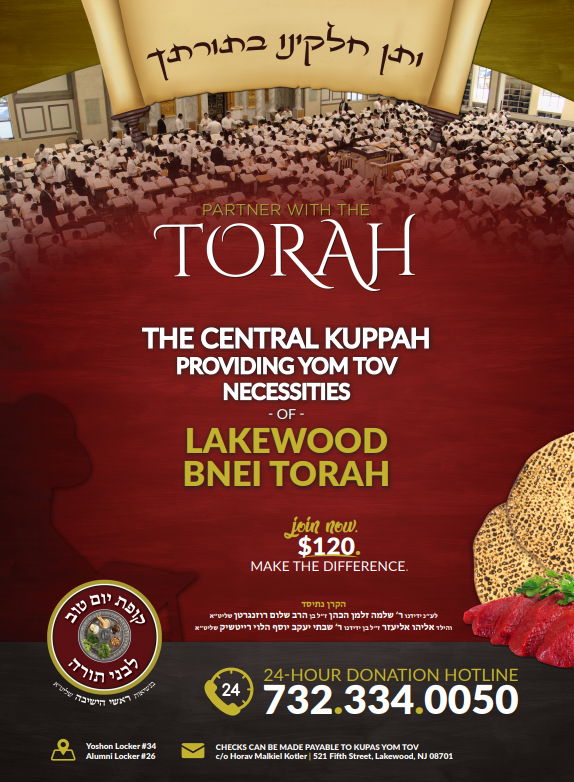 1000 Kollel Families with an ever growing budget, Kupas Yom Tov is the central Kupah providing for Yom Tom necessities of Lakewood Kollel Yungerleit. Imagine approaching the Seder night with a beautifully laid table, a full box of shmurah matzah, a few bottles of wine and the smell of chicken soup bubbling in the kitchen…and the zechus of a committed kollel family, enjoying the same, all because of you. It’s a partnership that will sit beside you as you read the Hagada, and a purchase that will last much longer than even the taste of the afikomen. This year, when you think Pesach, think Kupas Yom Tov. And know how much zechus you can bring to yourself and your family, this Pesach season. To join now, call 732-334-0050 or go to www.kupasyomtov.org sponsor a family or give whatever you can, and earn everlasting zechusim.